Steel vs sectional wood garage door – comparison chart. Which garage door is better? Available in variety of colors and finishes. Raised panels design is one of the most popular sectional steel doors style. Natural look of wood. Manufactured in wide range of colors and shades. Most popular species: cedar, hemlock, fir, and redwood. Wood garage doors can be stained or painted on-site in any imaginable color. Perfect option for any garage. Depends on wood door design. Many wind load rated wood garage doors manufactured to withstand over 90 mph wind. 25-gauge steel garage doors are susceptible to dents, but still they have fair resistance to impacts. Fire-rated steel doors have excellent resistance to open fires. Wood garage door can be easily damaged by fire. Non-insulated steel panels have very low thermal efficiency. Insulated with polyurethane foam steel doors significantly increase energy efficiency of a whole house. Depends on door style and insulation R-value. Depends on wood species and door quality. 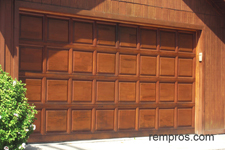 Some hardwood garage doors are extremely durable. Steel panels can easily last 60+ years, but garage door hardware has much shorter lifespan. Lifespan greatly vary. Wood garage door can last over 80 years if installed properly and maintained adequately. Wood door has to be treated properly in order to extend its lifespan. Greatly vary. Typically garage door producers offer 5 years limited warranty on steel sections and 3 years on door springs and hardware. Warranty on wood garage doors depends on manufacturer and product quality. Wood garage doors producers might offer from 1 to 3 years limited manufacturer warranty on their products. Depends on door dimensions and steel gauge. On average 16’ x 7’ insulated 25 gauge steel garage door weight about 210 – 250 pounds (95 - 113 kg). Greatly vary. Some solid wood garage doors could be extremely heavy. Sectional steel garage doors are one of the most affordable options. Prices greatly vary and some custom made wood garage doors might be quite expensive. Cost of sectional steel garage door installation normally lower compare to wood garage door installation. Normally it is cheaper to install steel door compare to wood. Sectional wood garage door installation is not a complicated task, but proper mounting door tracks, adequate installation of torsion springs and door openers might require some skills for performing the task successfully. Depends on door size and overall work complexity. On average, basic installation of 8’ x 7’ sectional steel garage door is a few hours project for an experienced installer with a helper. Replacement might take twice longer. Professional garage door installer with a helper normally is able to install 14’ x 7’ sectional wood garage door and programming door opener in 5 – 7 hours. Easy to repair. Damaged steel sections could be replaced with new ones. 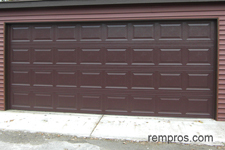 Sectional wood garage doors are not hard to repair. Loose hardware, broken spring, door opener failure, rollers out of the track, dents or rust on steel panels. Springs failure, problems with door opener, rotten wood panels. 1 Rating was estimated on the scale from 1 to 5, accounting 1 as lowest and 5 as the highest quality of a product. Always consider the fact: not all products made equally the same, and performance of particular garage door significantly depends on individual product quality, adequate installation, and proper maintenance. Sectional steel and wood are both great garage door options. Steel doors tends to be more popular because simplicity of installation and lower price. Wood garage doors normally are a great choice for custom build expensive houses with attached garages.